On Sepember 14, 2009 our lives were forver changed when the Dr told us that one of our twin boys had a condition called anencephaly and that it was incompatible with life. We chose to cherish every second that we were given with him. 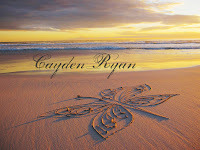 Cayden Ryan will live on forever in his twin brother Carter. It is so hard to believe how long it has been since I have written on here. I am truly sorry to those that followed when I wrote often...I am back and still breathing. I had so much to write but now sit here with no words. I am coming upon 4 years! (Wow, hard to beieve it's been that long!) since my boys were born in a few weeks and I've hit a new stage of grief. I am now a mom grieving for her twinless twin. As Carter and I lay in bed the other night Carter says, "Mama, when will Cayden be back from Heaven? I really want to sing Rock A Bye Baby to him." Caught off guard and Not really knowing what to say, I said, "Cayden isn't coming back from Heaven, that's his home." He then says," we have so many pictures of him here and why do we have to give him balloons up there, I want to give them to him here." I was honestly at loss of words and cried for hours after he fell asleep. I don't know how to answer his questions...I didn't expect them this soon. I don't know how to explain to my sweet little boy that his brother is dead and he will never see him again...it's breaking my heart. After almost 4 years, I was at a point in life where I was comfortable with my grief you could say. I still cried and missed Cayden daily, but I guess you just get to a different stage in it all. That was until my new grief hit and it has me crying at the drop of a dime. I am praying for the strength and wisdom to help Carter through this long road ahead of him. They are connected through a bond nothing can break. As we approach February 4th and 6th, I am going to rely on the strength of my family to get us through it, like it has brought us this far. My name is Chrissy. I am a wife, daughter, sister, friend and Mama to 3 beautiful children in my arms and 1 baby in Heaven. We lost our twin son, Cayden to a ntd, called anencephaly. It has been the hardest journey, but Cayden is worth every minute of it. I am here to blog about my fears and hopes in life after losing our son. Thanks Carly! You are such a gem!